The Indian School of Mine (ISM) Dhanbad grants admission in PG engineering courses via GATE and ISM Entrance Exam. The entrance test conducted by the institute is for admission of those candidates who did not appear for GATE. However, candidates who secured less marks in GATE or did not qualify it may also apply for ISM-EE. The Indian School of Mines was formally opened on 9th December 1926, by Lord Irwin, the then Viceroy of India to address the need for trained manpower related to mining activities in the country with disciplines of Mining and Applied Geology. In 1967 it was granted the status of a deemed to be University under Section 3 of UGC Act, 1956. Since its establishment, IIT(ISM) has undergone a considerable expansion of its activities, and presently it can be considered as a total technology education institute. Step 1: A program-wise separate online application is required to be submitted through an online portal, which will remain available in the IIT (ISM) website. Step 2: Then the candidates need to register themselves online by using the name, date of birth, email id, contact number. Then he/ she will get an email with a password. Step 3: The non-refundable application fee for each program is Rs. 500/- for UR/ OBC (NCL) candidates and Rs. 250/- for SC/ ST/ PWD/ Women candidates. The application fee is to be paid by online payment gateway only along with the online application. Step 4: It is the responsibility of the candidate, to ensure his/ her all eligibility criteria for a particular program, as mentioned in this information brochure, for applying the M.Tech Programme(s). Step 5: The image quality of the uploaded documents must be good enough to enable easy verification of the documents/ items. Care should be taken to scan the documents (with file format jpg/ jpeg) with the help of a high-quality scanner. The candidate should check the quality of the soft document before uploading. Step 6: Then the candidates need to fill the application form carefully by providing appropriate information. Step 7: At last the candidates need to press the 'Submit' button to complete the procedure. Candidates can access the application form by using email id, date of birth, password but they cannot edit the details. The non-refundable application fee for each program is Rs. 500/- for UR/ OBC (NCL) candidates and Rs. 250/- for SC /ST /PWD /Women candidates. The application fee is to be paid by debit card/ credit card/ internet banking. Candidates must possess a Bachelor degree in Engineering/ Technology or equivalent or a Master degree in Science, from the institutes recognized by UGC/ AICTE. The qualifying degrees for each of the M.Tech. Candidates must have GATE score (remains valid at the time of Admission) in the appropriate GATE Paper or need to qualify the Entrance Examination conducted by IIT(ISM). The candidate with equivalent degree and discipline are allowed to apply in different M.Tech programs. Under such cases, candidates have to mention the name of the equivalent degree and discipline in the application form with the declaration that such program is a specialized discipline of the requisite qualification mentioned in the information brochure. The candidate has to produce the “certificate for degree equivalence”, issued by any of the certifying authorities like UGC, AICTE, AIU etc. Candidates seeking admission to M.Tech. Programmes of the Institute should have o Minimum 55% or CGPA/ CPI of 5.5 on 10 point scale (without rounding off) in the qualifying degree for UR/ OBC candidates or Minimum 50% or CGPA/CPI of 5.0 in 10 point scale (without rounding off) in the qualifying degree for SC/ ST candidates. The candidates (other than sponsored candidates) must be below the age of 30 years (35 years for women, PWD, SC, ST & OBC (Non-creamy Layer) ) as on 20th April 2018. The ISM EE Admit Card will be available for download from 1st week of May 2018. Candidates will be able to download their ISM EE 2018 admit card from the official website. The conducting body will not dispatch it via any offline medium and only the properly registered candidates will be able to download it. Log in the official website of ISM EE. Submit the ISM EE application number and password. Download and print the ISM EE Admit card. 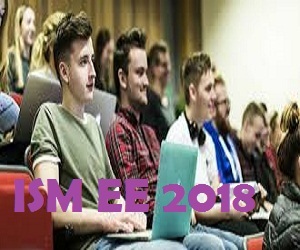 The ISM EE results will be announced in June 2018. Through the result, the candidates will be able to check their secured scores in the exam. The Counselling Process is separate for GATE and ISM EE qualified candidates. The schedule shall be released soon for both GATE and ISM EE 2018 qualified candidates and shall be held in two rounds for each. The candidates re required to register by submitting Rs.1000/- as counselling fee which is non-refundable, and counselling shall be done online. After registration the candidates should login and fill their choices of courses. After receiving all the data the seat allotment result shall be declared. When the candidates are satisfied with the allotment of seats, the candidates are required to confirm their allocation by reporting at the Institute.